Flying somewhere this holiday season? You won’t be alone. Nearly 1 million flights passed through U.S. airports in November and December last year. With air travel volumes still ascending, 2015 promises more of the same. That means higher ticket prices, longer lines at security and every traveler’s nemesis: overbooked flights. And big crowds are just one reason holiday travel can be a drag. Check out these 5 tips to save on holiday air travel. Along with the aforementioned inconveniences, lost luggage and flight delays also rate among the biggest downers for travelers and nothing grounds the holiday spirit quite like a canceled flight. Plus there’s the large expense of travel during the holidays. There are certainly ways to save money on travel (like by using rewards credit cards) and the obvious way to avoid these perils is to skip the traveling altogether and stay home for the holidays. If you must get out of dodge for a while, however, some airports will serve you better than others. Use SmartAsset’s credit card comparison tool to find great deals on travel rewards credit cards. PDX is number one. 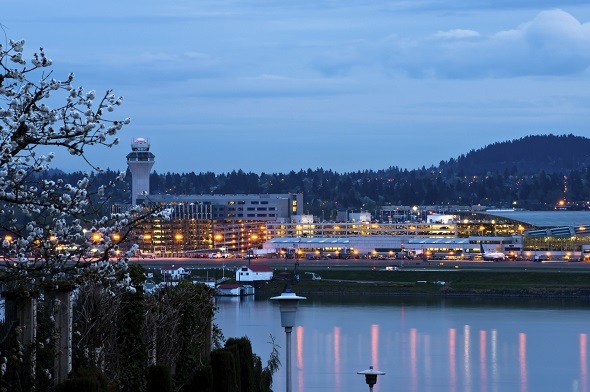 Portland International Airport, located less than 10 miles from downtown Portland, Oregon, rated as the most efficient U.S. airport. The average departure delay and cancellation percentage at PDX both rate in the top 5 lowest (aka best) among major U.S. airports. Western airports excel. 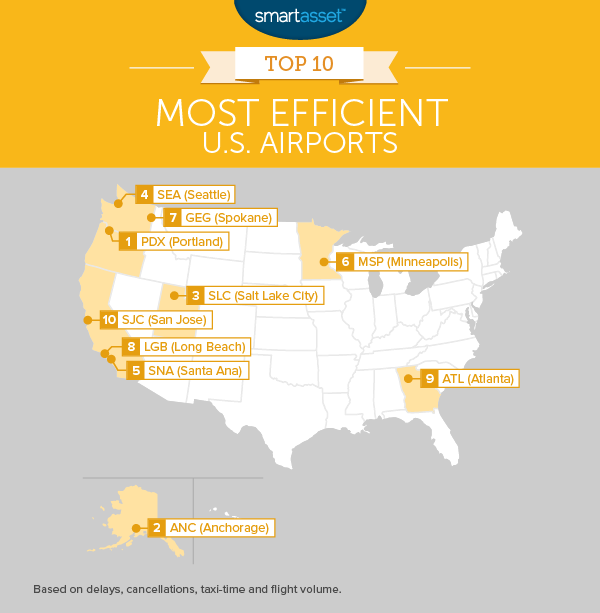 Eight of the top ten and all of the top five most efficient airports are located in Western states including Utah, Alaska and Washington. ATL: large and efficient. The country’s busiest airport is also among the most efficient. Despite moving some 374,000 flights over the past year, ATL rated in the top 20 for four of the metrics we considered. 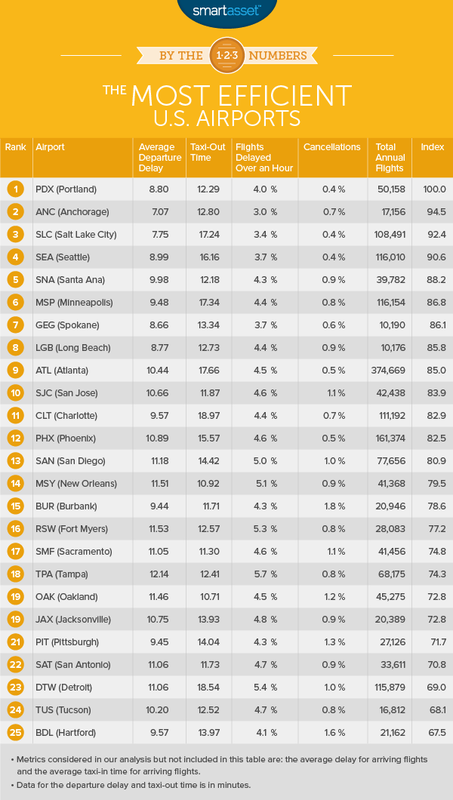 Portland’s much-beloved airport rated in the top 20 for every single efficiency metric we considered. Just 0.4% of flights departing from PDX over the past year were canceled, a fraction of the national average cancellation rate. Even on the rare occasions that a flight is canceled, travelers should find themselves fairly comfortable at PDX. The airport receives rave reviews for its dining and shopping amenities. Those who have some time on their hands might want to leave the airport altogether. Downtown Portland is easily reachable from PDX by light rail (one reason Portland is also a top city for conferences). Thinking about an Alaskan voyage this winter but worried about travel issues? Rest easy. ANC is among the country’s best airports. Just 0.7% of flights through ANC over the past year were canceled. Likewise, Anchorage International has the lowest average departure delay of any airport in the country at just 7 minutes. While Anchorage receives an average of 79 inches of snow per year, double the average in Chicago, the airport is never caught off-guard by winter weather. Plows are always at the ready to keep runways clear. Trying to pay off your credit card debt? Try SmartAsset’s free credit card calculator. Thinking about a ski trip this winter? If you’re wary of delayed or canceled flights putting a freeze on your plans, Salt Lake City may be a good hub for any downhill adventures. Salt Lake City International Airport rated second or first in four of the metrics we considered in our analysis. It has the second lowest average departure delay and second lowest cancellation rate. The second airport in the PNW to rank among the country’s top five most efficient, Sea-Tac has the lowest cancellation rate of any major U.S. airport. Just 0.37% of flights out of SEA were canceled over the past year. That is less than a quarter of the national average. John Wayne International is the most efficient of several airports in the Los Angeles area. Others include LGB (Long Beach) and LAX (Los Angeles), which respectively ranked eighth and 44th in our analysis. Santa Ana edges both on its cancellation rate and the percentage of departing flights that are delayed by 60 or more minutes. Less than 1% of flights out of SNA are canceled, while about 4.4% are delayed by an hour. The top-ranked airport east of the Continental Divide, MSP serves as a major hub for Delta Airlines. It is also the largest airport in the upper Midwest, handling some 116,000 flights over the past year. Despite that volume, MSP rated in the top 15 of major U.S. airports in four of the metrics we considered. Unsure how to choose a rewards credit card? We’ve got you covered. The only areas in which it did not excel were related to taxi-time. On average, it takes flights out of MSP 17 minutes to take off after they leave the gate. The second airport in Washington State to rank among the country’s top 10, Spokane International (formerly Geiger Field) handles about 10,100 flights per year. Among the cities which have non-stop flights to and from Spokane are Chicago, Minneapolis, Denver and Los Angeles. GEG rated third in SmartAsset’s analysis for both the average length of delays and the percentage of departing flights that are delayed by an hour or more. This Los Angeles-area airport is the smallest to crack the top 10, handling about 1.4 million passengers per year. As a result of local ordinances that restrict flight noise and frequency, it is unlikely to expand. Nonetheless, the airport has daily flights to a range of cities including Boston, New York and Austin. It also has the fourth lowest average departure delay of any of the country’s largest 100 airports. Hartfield-Jackson Atlanta International is easily America’s busiest airport, handling about 375,000 flights per year. That’s more than 1,000 flights per day, more than double the volume of all but four other U.S. airports. Nonetheless, despite that traffic, ATL performs quite well across the metrics SmartAsset analyzed. It had the fifth lowest cancellation rate of any major airport in the U.S., with cancellations on just half a percent of all departing flights over the past year. It’s major delay rate likewise ranked among the 20 lowest, with a mere 4.5% of flights leaving an hour or more after their scheduled departure from ATL. Flying into (or out of) the Bay Area? If you’re able to pick and choose your airport, San Jose International may be your best bet. It tops the airports in both San Francisco and Oakland for cancellation rates and the average length of departure delays. Arriving flights also reach their gate quickly at SJC, spending an average of just 4.2 minutes on the runway. That is the 9th lowest taxi-in time of any major airport. LGA (New York, LaGuardia). Among the 100 largest airports, LaGuardia ranks last (dead last) for both the amount of time spent on the runaway after leaving the gate and the percentage of flights that are canceled. This notoriously decrepit airport needs an upgrade. ORD (Chicago O’Hare). The nation’s second busiest airport is also among the least efficient. It rates last for both the average departure delay and the percentage of flights that are delayed by 60 or more minutes. 8.6% of flights leave an hour behind their scheduled departure at ORD. If you are flying into, out of or through the Windy City, our analysis shows that MDW (Midway) is the better choice. CID (Cedar Rapids-Iowa City). With two runways and annual flight volume of less than 8,000 departures, Eastern Iowa Airport was among the smallest airports in our analysis. It also rated as the least efficient. It had the second highest cancellation rate of the country’s 100 largest airports and the fourth highest average departure delay. Average departure delay. The average delay, in minutes, of departing flights. Percentage of flights delayed more than 60 minutes. Average taxi-out time. The time from leaving the gate to actual take off. Cancellation rate. The percentage of all departing flights that were canceled for any reason. Average arrival delay. The average delay, in minutes, of arriving flights. Average taxi-in time. The average time spend taxiing to the gate after landing. In order to control for airport size, we also looked at the total volume of flights for each airport. All things being equal, an airport that handles 100,000 flights while rating well on the above metrics is more efficient than an airport that handles 50,000 flights. After calculating these statistics for each airport, we ranked all 100 airports across all seven metrics. We then averaged those rankings, giving half weight to the taxi-in and taxi-out time for each airport and full weight to the other metrics. We assigned scores from 0 to 100 according to these average rankings. The top rated airport scored a 100, while the airport with the worst average ranking scored a 0. 1. We did not include Hawaii in our analysis. The state’s geographic isolation means that airports in Hawaii face significantly different operating conditions than airports on the mainland.